This was my first Cycle Oregon and I spent so much time struggling just to get through the course each day (except Monday's shorter course) that I was never able to enjoy the announcements, entertainment, or any other "extras." I understood that, though, given my age, my slower hybrid bike, and the length of the course. However, crossing the finish line in Elgin at 5:15 after getting up early and not dallying at rest stops, I was very disappointed that the party seemed to be over. There was no food to eat (other than greasy unhealthy food at the Elgin High School trailer across from the high school). Everything was being packed up, and I almost missed getting a shower because they were cleaning those and getting ready to leave. I'm happy about my accomplishment to ride 400 miles without a sag wagon, but I wish I could have celebrated with someone other than myself. No wonder people travel with a friend or group. What was the finish line like earlier in the day? Any other single riders experience this letdown? I finished a 1:00pm. I crossed the finish line and all I saw were people loading up and hitting the road. There were a few people sitting in the beer garden waiting for slower friends to show up but there was no party. It is pretty much understood that once you cross the line the party is over and it is time to go home. It is a bit of a shock for first timers because they aren't prepaired for such an abrupt end to CO but it has always ended like that. Two years ago when we arrived in Elgin I was very disappointed because there was no finish line party. This time I arrived in Elgin around 3:15. I had a totally different experience this time around. They handed out chocolate milk and a CO dog tag. The beer garden was open and everyone was celebrating with friends. Pizzacato was there too and the band was playing across the street. There was even a stupid looking Elvis working the crowd. I joined some friends for one last beer. 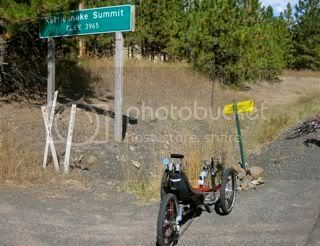 I thought that it was perfect for winding down and saying goodbye to Cycle Oregon. Back in earlier years when the ride ended, most departed the next day so the party went on into the night. With loop options and cars and buses leaving the day the ride ends, the last big celebration is usually the lunch stop as volunteers as well as riders leave shortly after finishing. There was a band, beer garden, retail area, community vendors up until the course officially closed at 5:00 PM. Then disbanded quickly after that. Man, I was just happy to get a shower, pack up my stuff and GO! I got there about 2:30 and there was a very warm greeting, chocolate milk, dog tags, Elvis, blues band, beer garden, etc. It's so weird to get in a car after a week on a bike. Cars are SOOO fast! However, it seemed to take forever to reach the overpass that we rode over on the optional Pedleton-Echo loop, once I passed through Pendleton westbound by car. I kept thinking that's the overpass, no that's the overpass, and on and on. Finally reached it. Testimonial to just how far you can pedal. I crossed at 12:30. High-fived Elvis and Smokey the Bear on the road into town. The band was still setting up, and I did not see any food (plus, nothing against CO food but I was ready for something different), so I pedaled over to long-term parking where bags were being unloaded. Saw my bag come off the truck, so I grabbed it took a shower, jumped in the car and set off for home. CO was great but for me the party ended the night before and I was ready to get home. I can understand your disappointment. I crossed the finish at 5:00 p.m. I did not go to main stage the night before so I wasn't aware that they were closing the course at 5:00. They started taking everything down right after I crossed the finish line -- almost didn't get a picture. I felt sorry for the people that were coming in after me. I thought "what a let down." It was my third CO and I was suprised that they closed the course earlier than the other days -- especially since the mileage was longer with a hard/long hill climb. Not everyone is a hammerhead. I left camp early and didn't dilly dally around at the stops either. The course routinely closes early than previous days on the last day. This is to allow the buses to load and get most everyone on the road early for wherever they plan on driving to. The normal last day course closure is closer to 4. I believe CO was planning on announcing the time change both on the main stage and posting it in the Cycle Oregonian. I didn't pick up a paper on the last day so I can't be sure. Congratulations on finishing the ride!! I've found the finish to most events to be pretty anti-climatic. The joy is to be found on the course, meeting new friends, personal accomplishments and seeing the vista's. Maybe next year with a little more training and experience you'll be a little faster? I finished early enought to hit the beer garden for one last beer and slice of pizza. I saw a few friends from the road but just breifly enought to say goodbye. All in all it was subdued and most people were busy going to their cars and getting out of there. I thought the finish was just fine. Had a beer and pizza, took a shower, said some goodbyes and hit the road. I got home by 9:30 PM (Portland). However, I felt a little bit somber the entire day. I had so much fun on the ride that I didn't want it to end. It reminded me of Outdoor School back in Sixth grade, crying on the bus because I didn't want to leave my new friends. I didn't cry this time, but I definitely felt a little mopey when I got home. Friends we were traveling with finished about 1:30, had showers, loaded bikes and gear and relaxed. We got in about 3:15, did a very quick chocolate milk, which I love, grabbed bags, took a very quick shower and were out of there. We like many others had a long trip to get home by Sunday PM, in our case, 940 miles, so needed to get a good start on Sat. We were not alone as there were a number of cars with bikes at the motel in Burns. Sadly, this may well be our final CO as age is beginning to take it's toll and we wanted to go out with a bang. We did the 6 days on our new bike, fondly called the John Deere, never walked and never SAGGED. I was shocked to see people in school buses riding to the top of the last day climb. For us, a big part of the satisfaction is completing what we set out to do. Our motto has always been, death before SAG. Thank you to all the staff, volunteers and others who have made our 4 CO's fun and memorable. I looked the whole ride for you John and Carol. Never saw a likely tandem to randomly call out names too though. lol. I thouht the end was a bit anti climactic, but often that is the case on these types of things. I got in at about 2:30 and was frankly rather sick of the bike and just rode to my car where my buddy who had sagged in was waiting and just took off for home. Tough last day, for me anyway. I definatly got started later than I wanted. Rode alone all day, so it was not my most enjoyable day on the road. Fun time though, I have mostly forgot the difficulties and will probably go next year if my medical issues stay away. Sorry we missed hooking up. We left every day about 7:45 and on the long days, got in about 3:00. There were a few Co-Motions out there but not as many as previous years. We were the only green and yellow. Hope your health holds and you get to do many more CO's. Not all of them are as tough as this one was. For us, only days one and 4 were relatively easy. The others were all pretty tough. A nasty saddle sore towards the end of the ride certainly didn't help any. Like many other writers, I needed something softer and wider, like our pick up seat, to sit on so I was thankful to see the end. Riding the rolling easy chair this year was the most fun I have had on a CO to date. Climbing was a breeze (a bit slower than usual but stress free) and downhills were a riot.